This book/CD pack teaches intermediate-level guitarists how to choose an appropriate tuning for a song, develop an arrangement, and solve any problems that may arise while turning a melody into a guitar piece to play and enjoy. This slap bass method book, designed for advanced beginning to intermediate bassists, is based on the understanding and application of modes. The focus is on the concept of groove sculpting from modes, and not on actual right- and left-hand techniques. The CD features recordings of all the examples, plus a split-channel option to let you practice your playing. Includes 13 songs. Appropriate for beginning guitar players or more experienced players wishing to learn specifics and songs in the bluegrass style, this book with two accompanying CDs teaches: how to embellish basic melodies; Carter style playing; shuffle rhythm patterns; alternate bass strumming; intros, turnarounds and endings; using the capo; cross picking; and more. Songs include: Foggy Mountain Blues � Bill Cheatham � Salt Creek � Devil�s Dream � Saint Anne�s Reel � Banks of the Ohio � John Henry � and more. 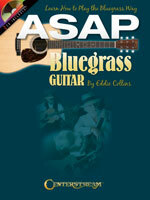 This book/2-CD pack delivers the meat and potatoes of bluegrass mandolin way beyond just teaching fiddle tunes! Players will discover how to find their way around the neck using common double stops, develop creative back-up skills, play solos to vocal tunes in the style of Bill Monroe, make up their own solos, and a whole lot more. For the average learner, this pack represents nearly two years worth of lessons! 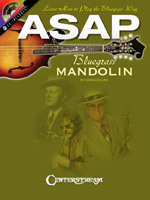 Includes two (2) instructional CDs: one plays every example in the book, and the 2nd contains 32 songs performed by a bluegrass band with the mandolin parts separated on the right channel. This unique book features 27 solos ARRANGED ENTIRELY WITH JUST CHORD DIAGRAMS! These fun songs � most with lyrics � ready for playing at all levels of ability. Chord diagrams are large for easy reading. Rhythm indications are simple to understand. 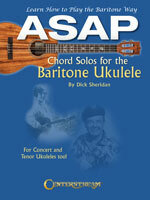 Intended primarily for the baritone ukulele, these solos can be played by both concert and tenor ukes, as well as on the top four strings of the guitar. A fun ASAP learning book. 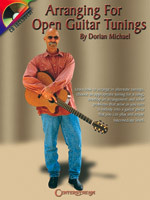 Background information on each song and helpful playing tips and useful insights are included. Songs include: Aura Lee, Down By The Old Mill Stream, Twelve-Bar Blues, Ja-Da, Memories, Dark Eyes, Hard Times, My Wild Irish Rose, Wang Wang Blues, Hine Ma Toy, My Buddy, and many more.